When I invited some friends over for dinner last Friday night, it seemed like a great idea. After I finished teaching a class and picking up the kids from school, I would have a few hours to get the house organized and prepare a proper meal before our guests arrived at 6:30. You know what they say about best laid plans. My husband didn’t make it home in time to take Mr. Picky to baseball practice. My girls each needed a ride here and there and then baseball practice was cut short because it was too dark to see the ball. So my uninterrupted time in the kitchen turned into Pamela’s taxi service. Has this ever happened to you? It’s a very good thing that barley risotto was on the menu. Traditional risotto is one of my favorite comfort foods, but it definitely requires a bit of babysitting. Maybe I had a hunch that Friday would not be the night to stir a pot of rice on and off for 20 minutes, because I planned for a version of risotto which I could pop in the oven and say “see ya later.” Barley takes the place of the classic arborio rice in this dish. Like arborio rice, barley releases that nice starchiness which is essential to make the risotto creamy and rich. Barley also packs a nice bit of protein and soluble fiber, which helps reduce cholesterol levels and support digestive health, but is missing from white rice. Unfortunately, barley does contain gluten and is not appropriate for people who are gluten-intolerant. This risotto almost parallels nature’s transition from winter to spring. It is hearty with the barley being a bit nutty and chewy, but the leeks, artichokes and lemon help keep everything tasting light and fresh. I am a huge fan of leeks and how grassy and mild they taste. 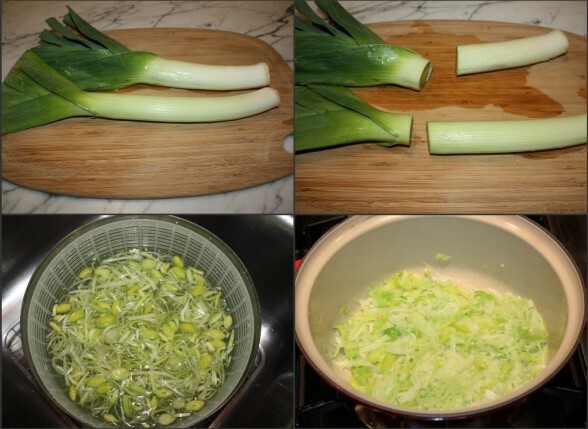 If you don’t have leeks, feel free to use shallots or onions. I am not embarrassed to admit that I don’t enjoy trimming artichokes, so I keep frozen or water-packed artichoke hearts in the kitchen at all times. Or adapt your favorite risotto recipe to use barley instead. There’s something about risotto which is like a warm blanket, encouraging you to slow down and relax for a bit. After a long week and a busy afternoon of shuttling children to and fro, it was so nice to sit down to a civilized dinner with friends. It didn’t even matter that the house never got organized. Artichoke and Spinach Barley "Risotto"
In a medium ovenproof pot or Dutch oven, melt 2 Tablespoons of the butter over medium heat. Add the leeks and sprinkle with sea salt. Sauté until softened, about 5 minutes. Stir in the garlic and cook for another minute. 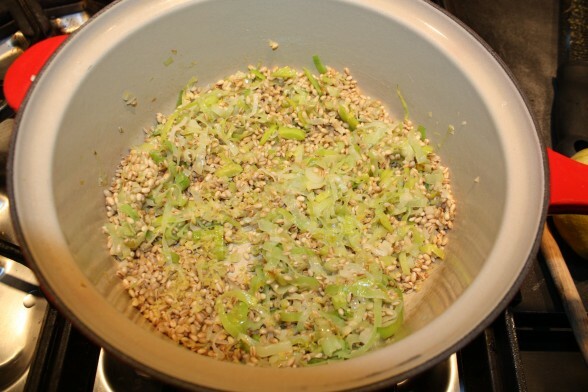 Add the barley and the lemon zest and stir to combine. Add the wine, raise the heat, and simmer, uncovered, until the wine has evaporated, about 5 minutes. Add all the stock, the artichokes and 1 teaspoon sea salt (add more to taste if your stock is unsalted), and bring to a boil. Cover the pot with a lid and transfer it to the oven. Say "see ya later!" Bake for about 1 hour, until the barley is tender and most of the liquid is absorbed. Remove the pot from the oven and uncover it. If it seems too liquidy, place over low heat and simmer a couple of minutes to reduce the liquid to your liking. I like it it a little looser than a pilaf. Otherwise, stir in the Parmesan, 1 Tablespoon butter, lemon juice, black pepper to taste and the raw spinach. Taste for seasoning and serve immediately. To reheat leftovers, add a little hot water in a saucepan or add enough stock to change it into a soup. I make this with mushrooms (shiitake, portobello and crimini), substitute the garlic for a 1/2 cup of diced shallots and leave out the lemon. It is a dream. The variations on this recipe are as endless as a frittata. I totally agree! Thanks for the suggestions, Alex! Mmmmm. I’m going to try this one. The one you’re making in our class today is spinach risotto. Can’t wait to try this!!! 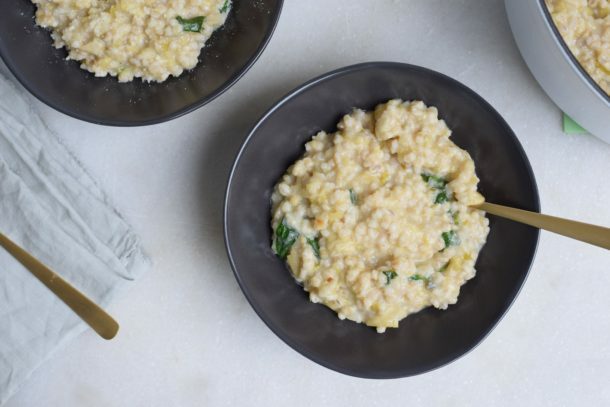 Even though I looooove a classic arborio rice risotto such as the one we did in class today, this barley version is way easier and just as tasty. Give it a go! Really must try this today! What would i replace for the wine as we don’t keep it in the house? I am actually not a wine drinker, but for risottos I keep a 4-pack of mini-wine bottles on hand so that I am not opening a whole bottle just for the one dish. I use Woodbridge Chardonnay by Mondavi, but I know many cooks prefer a Pinot Grigio. Wine does give a nice acidic lift to the risotto, so you need to substitute something that will do the same thing, such as a 1 teaspoon or so of a good quality wine vinegar added with the stock or just a little extra lemon juice at the end to taste. Let me know how it goes! I made this last night and I was in such a rush that I accidentally didn’t read to add the 3rd tablespoon of butter and lemon juice at the end (I put it in at the beginning before baking)and then just added the spinach and parmesan before serving and it still turned out perfect and yummy. I’m sure it would be better the other way, but for those in a rush to clean up while it’s cooking, this “accidental way” worked! I love the idea of popping it in the oven and letting it cook itself. I can’t wait to give it a try. Your recipes never disappoint! Thanks for the feedback, Luisa! This is one of the tastiest dishes ever! 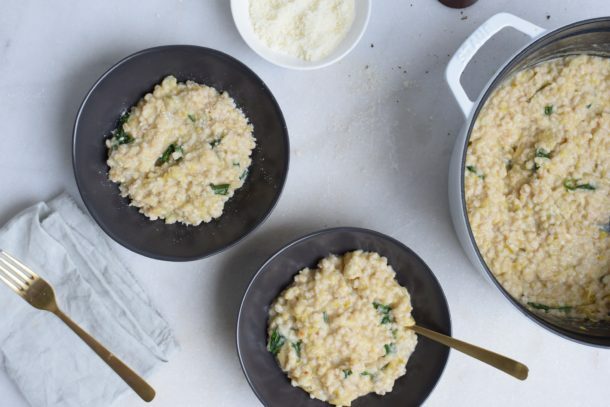 You can prepare the rest of your meal while the “risotto” cooks itself. I always receive compliments when I serve this dish. One of our absolute favorites!